Oct. 10, 2018: Early Wednesday afternoon, powerful Hurricane Michael made landfall along the Florida Panhandle as a record-setting Category 4 storm. The National Hurricane Center reported Michael's sustained winds were near 155 mph as the eye of the storm moved ashore near Mexico City, Florida at 1:30 p.m. ET October 10. According to NOAA's historical hurricane tracks database, Michael is the first Category 4 storm to make landfall along the Florida Panhandle since records began in 1851. This GOES East satellite imagery shows Hurricane Michael just as the storm made landfall at 1:30 p.m. ET October 10. Michael is expected to drop heavy rains across the Florida Panhandle, southeast Alabama and portions of southwest and central Georgia, with widespread totals of 4 to 8 inches expected. As the storm moves inland through the southeastern U.S., the storm will produce 3 to 6 inches of rain across northern Georgia, the Carolinas and southern Virginia. This geocolor-enhanced imagery was created by NOAA's partners at the Cooperative Institute for Research in the Atmosphere. The GOES East geostationary satellite, also known as GOES-16, provides coverage of the Western Hemisphere, including the United States, the Atlantic Ocean and the eastern Pacific. 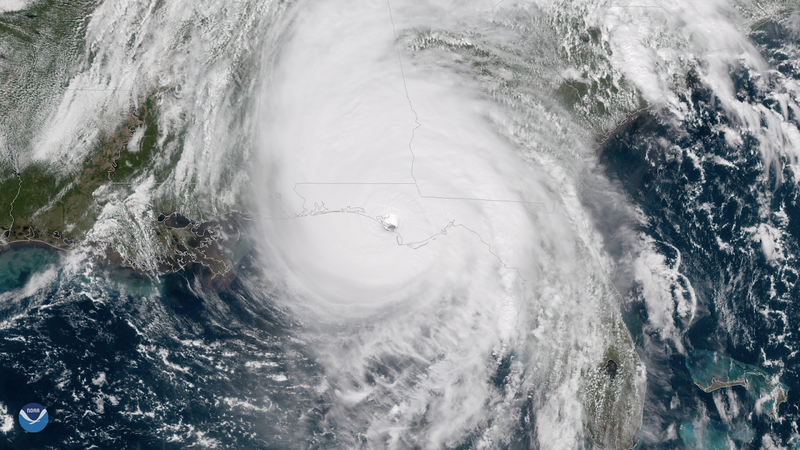 The satellite's high-resolution imagery provides optimal viewing of severe weather events, including thunderstorms, tropical storms and hurricanes.